Designed for agility, superb heel and ankle lock allows for quick cross overs and tigher turns. Ideal for fastest of playersa. The updated X-Rib pattern, that can be found throughout the Vapor line, was inspired by the OD1N concept skate. 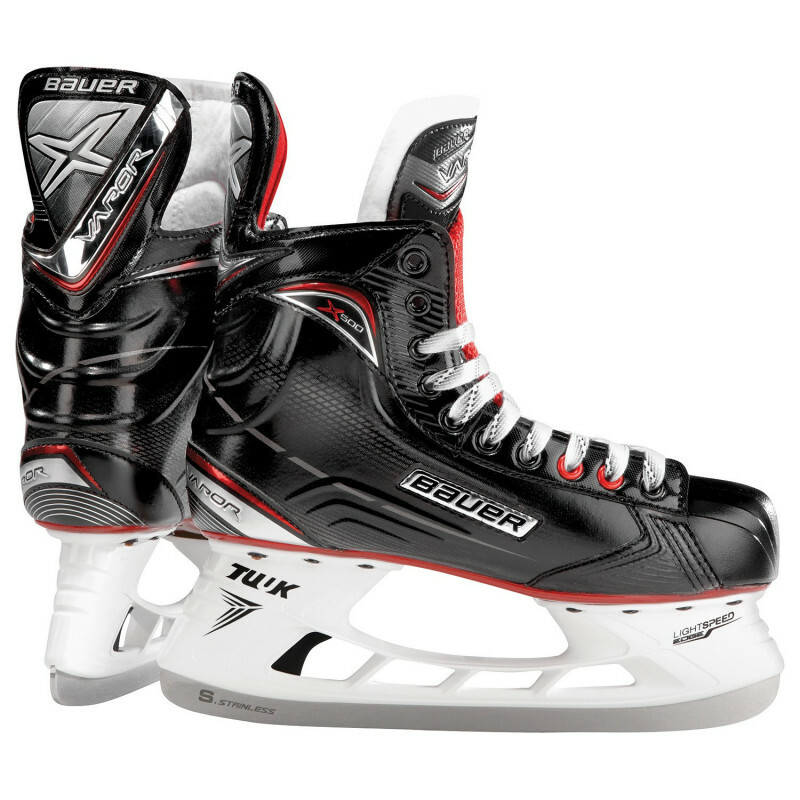 In addition to providing structural support to the skate, lab tests, designed to measure performance, showed that the X-rib pattern led to improvements in heel and ankle lock which resulted in quicker cross overs and tighter turns. This pattern is thermoformed into the sublimated tech nylon quarter construction of the X500 and also offers a jump start on a great fit, the balance of which can be achieved from heat molding the skate to the shape of your foot. The X500 uses a hydrophobic microfiber liner, which is both comfortable and helps to reduce drying time between ice times. The 2-piece felt design of the tongue features comfortable 40 oz white felt and includes a high-density foam metatarsal guard that provides extra support and protection. The boot sits atop a clear injected TPU outsole, which is a commonly used material for which to mount the Tuuk Lightspeed Edge holder. This holder design provides an added three millimeters of height, in comparison to the Tuuk Lightspeed 2 holder which allows the skater to get lower to the ice for sharper, tighter turns without “bottoming out” or in other words a greater angle of attack. The other huge benefit of this holder is the ability to change the runners in seconds with the pull of a trigger. Carrying an extra set of sharpened steel in your bag makes good sense, given the ease of which these can now be changed. The X500 comes with the Tuuk EDGE Super Stainless Steel, sometimes referred to as S EDGE Stainless, runner. In its class, you will find a lightweight skate with great lateral support at a value price in the Vapor X500 from Bauer. Check yours out today!